Sir David Attenborough brought viewers to tears as Climate Change: The Facts airs on BBC. 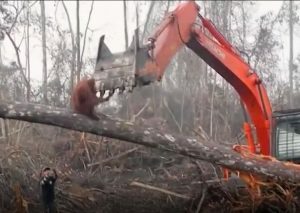 A clip from the episode shows an orangutan face to face with an industrial digging machine as it clears large sections of the forest for palm oil plantations. This is just one of the horrific ways that humans are contributing to the decline of orangutan populations. Additionally, the documentary focuses on how this type of invasive agriculture contributes to the destruction of our planet in the form of climate change. This episode is part of the larger Our Planet Matters series on BBC. CLICK HERE to read the full article on Mirror. 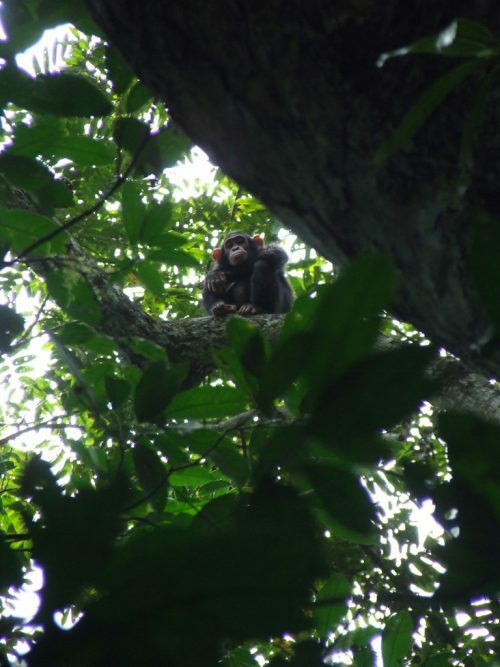 In a new paper published in ‘Folia Primatologica’ researchers have discovered a new set of behaviors exhibited by eastern chimpanzees (Pan troglodytes shweinfurthii). This so-called new ‘toolkit’ includes, “four different kinds of tools: a long ant probe, a short probe, a thin wand, and a digging.” The tools seem to have distinct characteristics that correspond to the goal of the tool use, something that is also characterized by the radically different tool use shown by different chimpanzee populations across Africa. 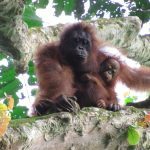 Our very own board member Dr. Anne Russon started a long-term study in 2010 on the wild Orangutans of Kutai National Park in Indonesian Borneo. Her research has found how weather caused by the El Niño Southern Oscillation (ENSO) cycle affects behavior, feeding ecology, habitat requirements, and birth intervals. 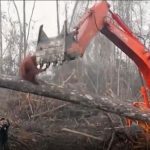 The knowledge gained from this study will allow researchers to better understand how orangutans adapt to different climates, which will be vital as they face the growing threat of man-made climate change. Photo: Female and infant orangutan in Kutai National Park. The morio orangutans of east Borneo are usually much darker than their Sumatran cousins. 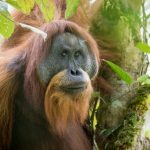 Image by Orangutan Project Kutai.